For the past five weeks I’ve been working on a big freelance project that has utterly consumed me and everything around me. I’ve been eating (literally) sleeping and breathing this project, and while I’m so excited about it and enthusiastic about it I’m also overwhelmingly exhausted. Tired in that way I wasn’t sure tired existed. Tired in that way where I almost forgot my own birthday. That kind of tired. Last week was my birthday; 27. That makes 27 years on this earth, which feels like many, many years from where I’m standing. I can’t complain, 26 was a good year, maybe the best one yet. We accomplished an amazing amount, I feel so much more settled and happy and centered than I did last year. We had a great birthday weekend– fireworks, a trip to Topsail with friends, a whole lot of cooking, drinks and bluegrass and cannolis with my mom. It was a good way to celebrate, and I’m excited for what’s to come. Most of what I’ve been cooking has been for the project, but I’ve managed to squeeze in a few recipes here and there that are just for us. On the way home from Carolina Beach on the 4th we picked up some local red drum and blackened it along with a medley of root vegetables I picked up from the farmer’s market. 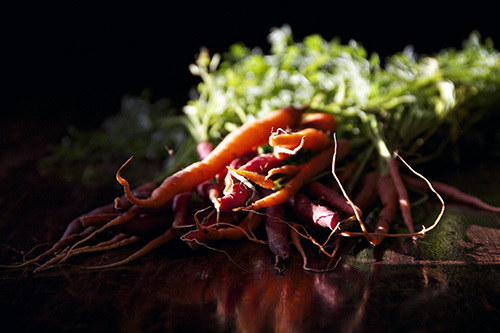 It was the perfect meal, light and fresh. 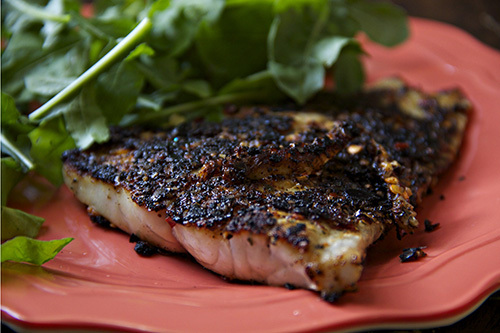 All the reasons to love summer blackened with spices and served up on one plate. Mix together spices. Heat a dry cast iron pan over a medium-high stove. Dredge filets first in butter, then in spices, making sure to coat well on both sides. Cook in hot skillet 2-3 minutes per side, until blackened and cooked through. Serve hot. Tip: This was super incredibly smoky, so my advice would be to try it on the grill if you can. Halve potatoes. 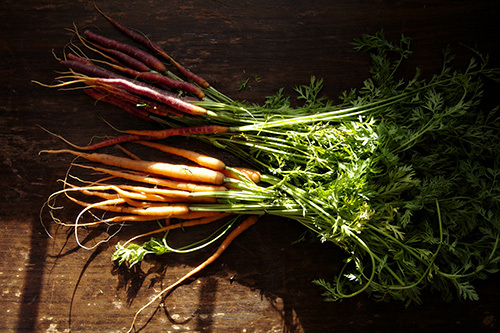 Clean carrots and cut off stems. 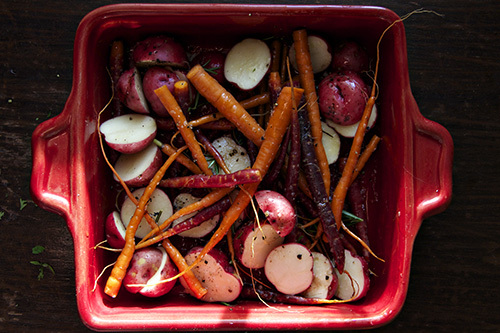 Toss potatoes and carrots in olive oil with rosemary (minced), salt, and pepper. Bake at 350 for 35-40 minutes or until potatoes are tender.